「Clear force Ultimate A2DC」 is carefully produced one by one by ORB 's master craft-man. 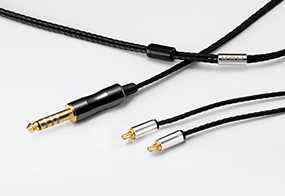 New designed ORB original cable‘PT4’uses PC-Triple C, it is known as high quality sound quality for the conductor. The plug is ORB’S original gun-metallic plated ‘CINQBES’. It is made of pure cupper in Japan. The gun metallic plated body shell is not only very beautiful and elegant but also getting better sound by high rigidity anti-vibration effect. You can feel clear, high-resolution and melodious sound by this cable. This is our Ultimate cable as reference model. Please enjoy wonderful music life with Clear force Ultimate! We selected PC-Triple C for the conductor of our new designed cable. It improves conductivity and acoustic characteristic. Our new flexible, smooth and less touch noise cable, PT4, has both superb sound quality and usability. The pure copper plug ‘CINQBES’ of 99.9% purity with excellent conductivity. It provides high resolution and excellent balanced sound. The mechanical strength of copper is generally inferior to brass, but ’CINQBES’ boasts the same mechanical strength as brass. It is applied nonmagnetic electroless nickel plating as an under-layer of gold plating and it thoroughly eliminates magnetism affect. We applied ORB original gun-metallic plate to the body shell. It achieves not only beautiful looks but also high rigidity to prevent vibration. You can feel excellent sound quality you have never heard. Under thorough quality control, soldering is done carefully one by one by hand in our factory with advanced technology by ORB Master craft-man. All soldering work is done by our master craft-man and that makes possible all cables have the same superb quality.